This article is about the guidebook publisher. For the theatrical work, see Lonely Planet (play). 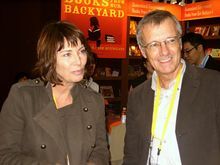 Maureen Wheeler (left) and Tony Wheeler (right), Co-founders of Lonely Planet. Lonely Planet is the largest travel guide book and digital media publisher in the world. The company is owned by BBC Worldwide, which bought a 75% share from the founders Maureen and Tony Wheeler in 2007 and the final 25% in February 2011. Originally called Lonely Planet Publications, the company changed its name to Lonely Planet in July 2009 to reflect its broad travel industry offering and the emphasis on digital products. After Let's Go Travel Guides, it was one of the first series of travel books aimed at backpackers and other low-cost travellers. As of 2010, it publishes about 500 titles in 8 languages, as well as TV programs, a magazine, mobile phone applications and websites. Lonely Planet also has its own television production company, which has produced numerous series: Lonely Planet Six Degrees, The Sport Traveller, Going Bush, Vintage New Zealand, Bluelist Australia and Lonely Planet: Roads Less Travelled. Lonely Planet is headquartered in Footscray, a suburb of Melbourne, Australia, with affiliate offices in London and Oakland, California. As of 2009, it was increasing its digital, online presence greatly. In 2009 Lonely Planet began publishing a monthly travel magazine called Lonely Planet Magazine in the UK, and in 2010 it launched the Indian and the Argentine editions. The company name comes from a misheard line in "Space Captain," a song written by Matthew Moore and first popularized by Joe Cocker and Leon Russell on the "Mad Dogs & Englishmen" tour in 1970. The actual words are "lovely planet", but Tony Wheeler heard "lonely planet" and liked it. 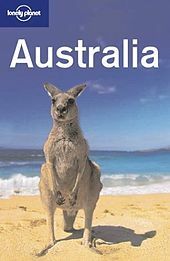 A recent edition of Lonely Planet's guide to Australia. Lonely Planet's first book, Across Asia on the Cheap, was written and published by Englishman Tony Wheeler, a former engineer at Chrysler Corp and the University of Warwick and London Business School graduate, and his wife Maureen Wheeler in Sydney in 1973, following a lengthy trip from Turkey, through Iran, Afghanistan and Pakistan, to India and Nepal. The popularity of this overland route, first undertaken by vehicle on the 1955 Oxford-Cambridge Overland Expedition, declined when Iran's borders closed in 1979. Written with strong opinions, it sold well enough in Australia that it allowed the couple to expand it into South-East Asia on a Shoestring (nicknamed the 'Yellow Bible'). Lonely Planet's first books catered to young people from Australia and Europe undertaking the overland hippie trail between Australia and Europe, via South-East Asia, the Indian subcontinent and the Middle East. This was becoming something of a rite of passage for young travellers, especially Australians and New Zealanders, who spent months (or years) on the journey. Tony and Maureen Wheeler wrote their second Lonely Planet guidebook, South-East Asia on a Shoestring, in early 1975 in the Palace Hotel at 407 Jalan Besar in Singapore. The guidebook series expanded initially in Asia, with the India guidebook, first published in 1981. In the 1990s the company expanded into Europe and North America. The company currently publishes about 500 different titles. In addition to books about most countries in the world, it also publishes a range of specialised thematic guidebooks. The current Lonely Planet range also includes hardback photography books, food guides, city guides, travelogues, diaries and calendars, language guides, walking guides and guides covering an area of interest in more detail, for example a Volunteer Travel guide or a National Park guide. Over the years, its target audience has expanded from budget-conscious backpackers to include more mainstream and affluent travellers. On 1 October 2007, a 75% stake in the company was purchased by BBC Worldwide, the commercial arm of the British Broadcasting Corporation, with the Wheelers retaining the other 25%. The Wheelers announced that this was so they could spend more time travelling. On 18 February 2011, BBC acquired the remaining 25% of LP for A$67m from the Wheelers. Lonely Planet's online community, the Thorn Tree, is used by over 600,000 travellers for trade tips and advice. The Lonely Planet website includes blogs, Facebook Connect, a groups platform, the ability to rate and review sites and restaurants, as well as a Trip Planner tool. In 2006, Tony Wheeler launched a joint awareness campaign with Mark Ellingham (founder of Rough Guides, another established travel publisher) on the impact of commercial aviation on climate change. The two companies urged their readers to "Fly less, stay longer" wherever possible. The founders, Tony and Maureen Wheeler, have written a book titled Once While Travelling: The Lonely Planet Story (known as Unlikely destinations: The Lonely Planet story in North America) telling how they met and married, how they travelled from London to Australia overland and how Lonely Planet was formed. A mention in a Lonely Planet guidebook can draw large numbers of travellers, which invariably brings change to places mentioned. For example, Lonely Planet has been blamed for the rise of what is sometimes referred to as 'the Banana Pancake Trail' in South East Asia. Critics argue that this has led to the destruction of local culture and disturbance of once quiet sites. Lonely Planet's view is that it encourages responsible travel, and that its job is to inform people, and that it is up to guidebook users to make their informed choice. The publication of its guidebook to Myanmar (Burma) is seen by some as an encouragement to visit that country, which theoretically supports its current military regime, against the wishes of the democratic opposition led by Aung San Suu Kyi, and led to calls for a boycott of the company. Lonely Planet's view is that it highlights the issues surrounding a visit to the country, and that it wants to make sure that readers make an informed decision. In April 2008, American writer Thomas Kohnstamm published the memoir Do Travel Writers Go to Hell?, which touched on his experience writing a guidebook for Lonely Planet in Brazil. Pre-publication speculation about the book's content kicked off a global media controversy, but both Thomas Kohnstamm and Lonely Planet discredited the controversy as being based on incorrect information. After a review of Kohnstamm's guidebooks, publisher Piers Pickard agreed that no inaccuracies had been found. In 2009, Australian author and former Lonely Planet guidebook writer Mic Looby published a fictional account of the guidebook-writing business which lambasted the travel guide industry, titled Paradise Updated. Lonely Planet: Roads Less Travelled – A co-production between Singapore's Beach House and Lonely Planet Television, airing on the National Geographic Adventure Channel 2009-2010, RLT is a reality-based travel series following nine LP guidebook authors and photographers. ^ "About Us". Lonely Planet. http://www.lonelyplanet.com/about/. Retrieved 5 March 2011. ^ Fildes, Nic (2 October 2007). "BBC gives Lonely Planet guides a home in first major acquisition". The Independent. http://www.independent.co.uk/news/media/bbc-gives-lonely-planet-guides-a-home-in-first-major-acquisition-395739.html. Retrieved 5 March 2011. "Lonely Planet has grown into the world's largest travel guide publisher"
^ Sweney, Mark (18 February 2011). "BBC to buy out Lonely Planet". The Guardian. http://www.guardian.co.uk/media/2011/feb/18/bbc-worldwide-lonely-planet-travel-guides. Retrieved 5 March 2011. ^ Swisher, Kara (12 October 2009). "Lonely Planet Ramps Up Digital Strategy, Names John Boris U.S. Head". kara.allthingsd.com. http://kara.allthingsd.com/20091012/lonely-planet-names-new-u-s-head-as-its-digital-strategy-escalates/. Retrieved 10 August 2010. ^ "Kareena & Saif launch Lonely Planet Magazine". Sify Movies. http://www.sify.com/movies/Kareena--Saif-launch-Lonely-Planet-Magazine-imagegallery-bollywood-kb4pRAeaadj.html. Retrieved 24 August 2010. ^ Paris, Eva (13 May 2010). "La revista Lonely Planet estrena edición argentina" (in Spanish). diariodelviajero.co. http://www.diariodelviajero.com/america/la-revista-lonely-planet-estrena-edicion-argentina. Retrieved 10 August 2010. ^ a b Wheeler, Tony; Wheeler, Maureen (2007). Unlikely Destinations: The Lonely Planet Story. Periplus Editions. ISBN 978-0-7946-0523-0. ^ "Lonely Planet Publications Pty Ltd.". fundinguniverse.com. http://www.fundinguniverse.com/company-histories/Lonely-Planet-Publications-Pty-Ltd-Company-History.html. Retrieved 5 March 2011. "[...]and began writing their first travel guide. The effort was truly homespun, a hand-collated, trimmed, and stapled guidebook that was 96 pages long.[...] The 96-page travel book, which eventually became a collector's item, was entitled Across Asia on the Cheap, published in 1973." ^ "Asia's overland route". LiveJournal. 20 July 2006. http://bailey83221.livejournal.com/97083.html. Retrieved 5 March 2011. ^ MacLean, Rory (2007). Magic bus: on the hippie trail from Istanbul to India. Penguin Books. ISBN 978-0-141-01595-8. ^ Steves, Rick (24 november 2007). "Tony Wheeler's "Lonely Planet"". ricksteves.com. http://www.ricksteves.com/radio/archive.htm#115. Retrieved 24 november 2007. ^ "BBC buys Lonely Planet". The Age. 1 October 2007. http://www.theage.com.au/news/business/bbc-buys-lonely-planet/2007/10/01/1191091011676.html. Retrieved 1 October 2007. ^ "BBC Worldwide acquisition of Lonely Planet". BBC. 1 October 2007. http://www.bbc.co.uk/bbctrust/our_work/commercial_services/lonely_planet.shtml. Retrieved 1 October 2007. ^ "Time to move on say Lonely Planet founders". AdelaideNow. 2 October 2007. http://www.adelaidenow.com.au/travel/time-to-move-on-say-lonely-planet-founders/story-e6freexc-1111114558304. Retrieved 5 March 2011. ^ "BBC takes last slice of Planet". The Sydney Morning Herald. 20 February 2011. http://www.smh.com.au/business/bbc-takes-last-slice-of-planet-20110219-1b09f.html. Retrieved 5 March 2011. ^ "Thorn Tree Travel Forum". Lonely Planet. http://www.lonelyplanet.com/thorntree/index.jspa. Retrieved 5 March 2011. ^ Wheeler, Tony; Wheeler, Maureen (2005). Once while travelling: the Lonely Planet story. Periplus Editions. ISBN 978-0670028474. ^ Todhunter, Colin. "Madras and The Lonely Planet People". hackwriters.com. http://www.hackwriters.com/Madras.htm. Retrieved 24 August 2010. ^ Priestley, Harry (July 2008). "Pictures courtesy of Lonely Planet Publications". chiangmainews.com. http://www.chiangmainews.com/ecmn/viewfa.php?id=2228. Retrieved 10 August 2010. ^ "Unions call to boycott Lonely Planet". News Limited. 22 February 2008. http://www.news.com.au/travel/news/unions-call-to-boycott-lonely-planet/story-e6frfq80-1111115617829. Retrieved 24 August 2010. ^ Wheeler, Tony; Wheeler, Maureen. "Responsible travel". Lonely Planet. http://www.lonelyplanet.com/about/responsible-travel. Retrieved 24 August 2010. ^ "Lonely Planet's bad trip". The Daily Telegraph. 13 April 2008. http://www.dailytelegraph.com.au/news/sunday-telegraph/lonely-planets-bad-trip/story-e6frewt0-1111116046776. Retrieved 13 April 2008. ^ "Lonely Planet: Roads Less Travelled". National Geographic Channel Australia and New Zealand. http://natgeotv.com.au/programmes/lonely-planet-roads-less-travelled/biographies. Retrieved 24 August 2010. All About Animals • Amy • BBC Countryfile • BBC History • BBC Music • BBC Focus on Africa • BBC Wildlife • Doctor Who Adventures • Easy Cook • Focus • Gardeners' World • Gardens Illustrated • Girl Talk • Good Food • Homes & Antiques • BBC Knowledge • Lonely Planet Magazine • Match of the Day • olive • Radio Times Sky at Night • Top Gear • Top of the Pops • Who Do You Think You Are? This page was last modified on 19 April 2011 at 06:37.